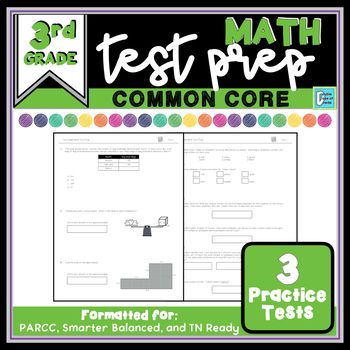 Looking for some high-quality PRACTICE TESTS to prep your students ready for Smarter Balanced, TN Ready (Tennessee state assessment), PARCC, or other state assessments? This resource covers EVERY Common Core standard for 3rd grade math. Question types include multiple choice, fill in the blank, constructed response, matching, and completing graphs/charts. There are 3 different tests included with this test preparation that look and feel like the "real thing" for students. 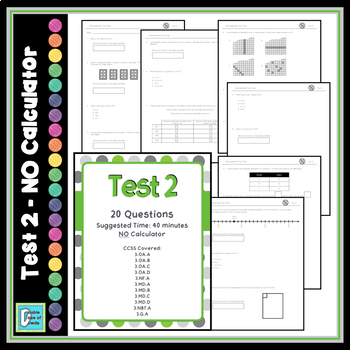 Each test has a cover page for teacher use that lists the number of questions, suggested time limits, calculator restrictions, and Common Core standards included. 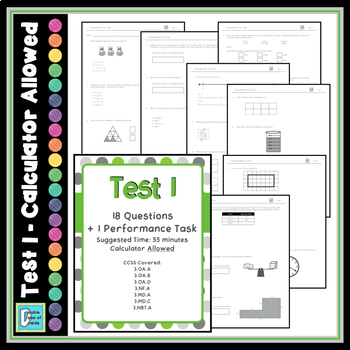 Also included for teachers are answer keys, CCSS correlations, and student data charts. Constructed response tasks are one extended problem with multiple parts. In this scenario, students are required to think critically in order to solve a series word problems like those found on state assessments. ♥ "This is a MUST HAVE! Love it!" ♥ "This was a great way to review and was easy to use!" ♥ "Great practice for state assessments!"